Here is a market segmentation example for retailers, with a focus on large supermarkets. As you probably know, supermarkets are classified as service firms. As a result, their marketing mix extends to the 7P’s. Although almost all consumers will visit supermarkets, there are a range of different market segments all with different needs, as shown in the following diagram. The challenge for developing the marketing strategy and marketing mix for larger supermarkets is how they can meet the needs of multiple segments within the same physical facilities. The marketing challenge for smaller supermarkets is to determine the most appropriate consumer segment to choose as their target market, which in turn will determine the best marketing mix design. 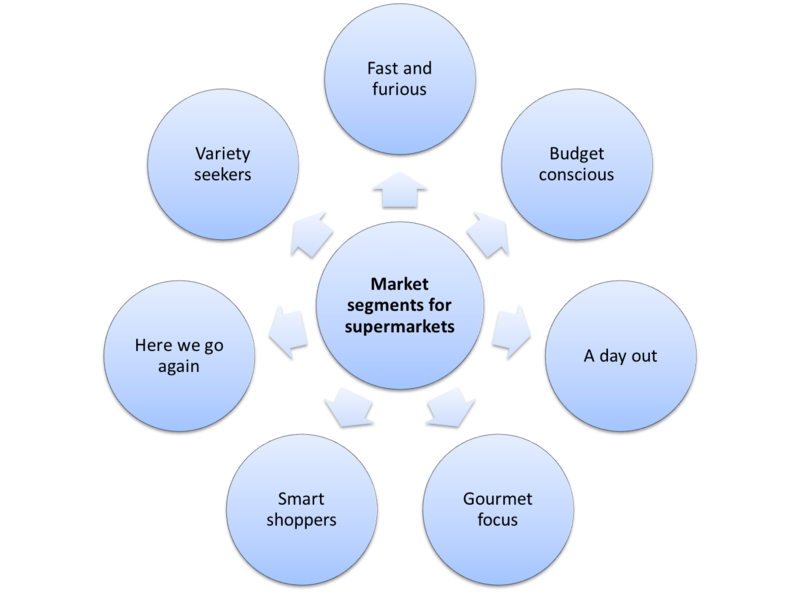 In this market segmentation example for supermarkets, seven possible market segments have been identified. A brief segment profile, along with suggestions for key elements to consider in structuring a suitable marketing mix is included in the table below. These consumers want to complete their shopping as quickly as possible. They are habitual buyers and are loyal to the supermarket and brands, due to their need to make their supermarket experience highly time-efficient. They tend to be busy people (perhaps with family or career – making them mostly in the 30-50 years age range). This segment wants to find items quickly and be able to get in and out of the supermarket as fast as possible. Therefore, their prime need is for convenience. As a result, they are more likely than other segments to also frequent convenience stores. Budget conscious consumers are limited to a fixed budget for their shopping purchases. And, as a result, tend to seek out lower priced an discounted items.They tend to be somewhat loyal to lower-priced brands, which often happen to be private label brands. However, they are happy to switch for discounted brands (to take advantage of sales promotions). These consumers enjoy shopping and are happy to spend large amounts of their time browsing and looking through stores.In particular, they enjoy bargains and finding new and unusual merchandise.They vary by demographic profile, but are generally more likely to be female and often will shop in social groups. This group of consumers like stores that are interesting in their layout and design.An array and variety of merchandise (product mix) is highly important to this target market as they seek out new products (and are less likely to be habitual purchasers as a result). This target market are seeking higher quality products (and foods in supermarkets) and are willing to pay a price premium.They tend to equate “value” with higher quality and some of these consumers derive social status from their purchasing behavior. Smart shoppers These consumers take pride in their ability to shop. They see themselves as being quite effective in determining value and “spotting a bargain”.They are not the same as the budget-conscious market segment above, as they do not always look for the cheapest product.Instead they are looking for the best value product offer. This may be a major brand on discount, or a two-for-one offer, or a larger packaging size, and so on. This market segment like to generate self-esteem from their shopping success of obtaining bargaining. As a result, they dislike consistent product and pricing offers.Instead, these consumers need a variety of sales promotions and price differences between stores. This allows them to seek out the best offers in the marketplace. For more market segmentation examples.